Previously I wrote laymans explanation of the blockchain. I’ve been asked to write an explanation of what cryptocurrencies and distributed ledger technology is. This is my attempt at explaining cryptocurrencies and hopefully later I’ll come back to distributed ledger tech and it’s potential. What are cryptocurrencies? Well to start off with, let’s not over complicate it by worrying about the “crypto” part and simplify things down a bit. A cryptocurrency is a virtual form of money that anyone can create. Imagine you had a large printing press and decided to print your own money. By doing so, you would effectively create your own currency. Virtual currency is the same, except the money exists digitally rather than in paper form. The key thing to understand is that it is only transferable and only has value based on who or what is backing it. If I offered you $100 USD vs. $100 Monopoly money, which would you take? USD you know you can readily use and would be accepted almost anywhere on the planet. Monopoly money, by contrast, is really only valuable in a game of monopoly. Outside of monopoly, it is worthless and no one sane would give you anything for it. Currencies that aren’t backed by a physical asset of some sort are a figment of human imagination. They only hold value if people think they do for otherwise they’re worthless. For many years, USD was backed in value by physical gold. The ability to exchange your USD for gold at any time is what made people believe in its value. Today, it is a global medium of exchange backed by the US government and US Treasury and that backing is what lends people to still trust its value. Bitcoin is also a figment of human imagination. It is backed by nothing of actual value but is built on a technology called the blockchain. The block chain provides a near irrefutable medium of trust backing the bitcoin currency. That trust is acheived through distribution and cryptography. Meaning it is near impossible to corrupt it and the log that backs all of the transactions made in it going through history. So the currency itself is nearly uncorruptible, however it’s value is a different story. Bitcoin is only as valuable as people deem it to be. It is not tied to any underlying asset so a bitcoin is only worthwhile if you can exchange it with someone else for something of value. This is the looming problem with the debate over whether or not bitcoin is in a bubble. Many people are buying bitcoin because other people are buying bitcoin, not because they want to exchange it for something else or use it as a medium of exchange. The trouble is that in order for it to maintain its value, you need to have someone else to sell it to. There are realistically few places that accept it, the transaction costs are high and if suddenly everyone wants to recoup their earnings at the same time it can lead to a crash where there are many more sellers than buyers. I highly recommend reading this article if you’d like to know more about Bitcoin’s underlying value. It is the clearest writeup I’ve seen yet. So bitcoin fundamentally has value because people believe in it and it’s potential. As long as people continue to believe in it it will continue to have value. If that changes, bitcoins value will change. So that’s bitcoin, how is it different from other cryptocurrencies created as part of “initial coin offerings” (ICOs) and referred to as “tokens”? What are ICOs? ICOs are the equivalent of people printing their own money. Fundamentally, people create their own money and then, via the internet, offer their newly created currency for people to purchase. This “initial coin offering” is being used as a funding mechanism for various concepts. An important thing to understand is that when you purchase the money/tokens/currency of an ICOs, you’re purchasing the equivalent of paper money someone has printed that in most cases gives you no entitlement to ownership of any sort of an asset. For many years the retail chain in Canada called Canadian Tire printed it’s own money. That money was usually given out as part of a loyalty scheme where a certain percentage of your purchase was given back in the form of Canadian Tire money. It is a currency that is only valid and accepted in Canadian Tire stores. Outside of those stores it has no value except in trade with people who would use it to shop in those stores. Imagine that Canadian Tire was struggling financially. They decided they wanted to raise money by using an ICO. They turned around, created a new “cryptocurrency” version of Canadian Tire money and sold it via an initial offering on the internet. This would allow people to trade currently accepted, transferable and government backed Canadian or US dollars for this new Canadian Tire cryptocurrency or tokens. Canadian Tire gets real money they can use to fund their operations, you get virtual money you can use to buy things in their stores. Here’s a key point to understand. By buying Canadian Tire’s cryptocurrency you don’t actually end up owning anything. It provides absolutely nothing more than the ability to spend that currency in their shops. If Canadian Tire goes out of business? Your currency is worthless, just as your stash of paper Canadian Tire dollars would be. The big challenge of cryptocurrencies like Bitcoin, Litecoin, Ethereum Coin, Bitcoin cash and other ICOs is that the market is horribly unregulated and you could end up buying a currency that in the end is not transferable and ultimately worthless. This is key to understand before getting caught up in the hype. So, if cryptocurrencies are inherently risky and virtual does that mean Bermuda should be avoiding them? Frankly, no. Cryptocurrencies are a highly unregulated industry at the moment. Opportunities exist for jurisdictions to provide the right regulatory framework to enable cryptocurrencies to be trusted for everyday use and flourish as a new medium of exchange. We effectively have arrived at an age where anyone anywhere can create their own currency. This has power in that it has democratized a key founding principle of what powers modern society. Currencies act as a transferable store of value and medium of exchange and it is tremendously valuable to enable people to be able to create them to empower groups, organizations or individuals. Many great innovations will arise as a part of it, however there will be many growing pains along the way. So what about distributed ledger technologies and the blockchain? Cryptocurrencies are only the tip of the iceberg, the most well known application of the blockchain. The real future is leveraging DLT for much bigger and better concepts, however that’s a wholly larger discussion and one which will have to wait for another article. As a followup to my earlier research on gaming acts, Minister Simmon’s mentioned Nova Scotia in his Bernews interview and I thought I’d take a quick look at their gaming act. Should we strive for more independence or more control to ensure a successful gaming industry? Social media has been set alight by the proposed Casino Gaming Amendment Act, a fire stoked between those who fear political interference and those who believe the government has a right to set the direction for gaming on the island. When it comes to gaming governance there is wide variance between strict independence such as New Jersey’s which offers a bi-partisan fixed term, reasoned dismissal approach and that of Singapore which allows for significant Ministerial intervention. Which is the best fit for Bermuda given our environment, political history and desire for a successful gaming industry? The opposition has thrown down the gauntlet speaking to those who fear our history of issues becoming stymied by political interference and scandal, defending their version of independence. By contrast, the government speaks to their significant mandate from those who desire them guiding the course of policy. Was the original law independent or lax enough? Is the proposed change one that risks enabling political interference and eliminating the independence of the gaming commission? Is the proposed change one which will bring us in alignment with other jurisdictions allowing the government more control over appointments and policy implementation? 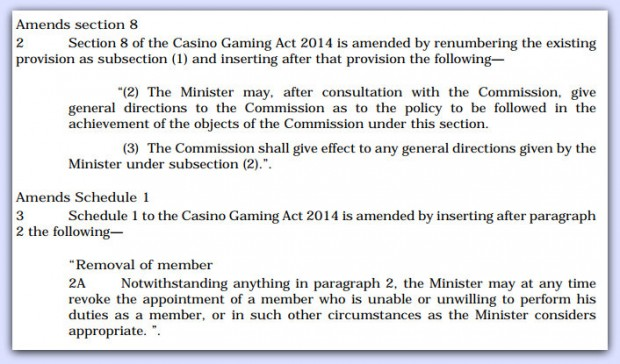 The existing Casino Gaming Act, implemented by the now opposition provided provisions for varying initial fixed term appointments by the Minister of the day. Limited provisions were added for the removal of a member on the basis of bankruptcy or criminal offenses. Otherwise, members were appointed and cannot be removed. The premise appears to have been to provide rotating fixed terms of 3 years for commission members to provide continuity across changes in governments. Many have decried the lack of “independence” in these original appointments as justification for changing legislation to allow for a change in the guard now. Did the original legislation go far enough in ensuring independence in the commission and the appointment of its commissioners? The amendment itself, as published by Bernews, provides provisions for the Minister to remove members from the commission at will as well as give directions on policy. This represents a substantial departure from the OBA’s original intent. Minister Simmons argues that the current commissioner has failed in his duties and should be replaced. It is his assertion that this is the right of a new government to replace commissioners as they see fit. He suggests this is fairly standard practice internationally and cites Singapore as an example. What does the Singapore’s Casino Control Act say? (b) such other members, not being less than 4 or more than 16, as the Minister may, from time to time, determine. (2) The Schedule shall have effect with respect to the Authority, its members and its proceedings. 11. The Minister may, after consultation with the Authority or otherwise, give to the Authority such directions, not inconsistent with the provisions of this Act, as to the performance and exercise by the Authority of its functions, duties and powers under this Act as the Minister may consider necessary, and the Authority shall give effect to all such directions. Thus, indeed Mr. Simmons is correct in suggesting that Singapore does allow the membership of the authority to be chosen by the Minister. It also matches the proposed legislation in that it enables the Minister to give policy directions to the body itself. However, various individuals on social media have decried Singapore as a poor example of a strong democracy and not one we should emulate. According to the wikipedia article on Singapore, it is not held in the highest regard for democratic freedom. Although the elections are clean, there is no independent electoral authority and the government has strong influence on the media. Freedom House ranks Singapore as “partly free” in its Freedom in the World report, and The Economist ranks Singapore as a “flawed democracy”, the second best rank of four, in its “Democracy Index“. In 2011, the World Justice Project‘s Rule of Law Index ranked Singapore among the top countries surveyed with regard to “order and security”, “absence of corruption”, and “effective criminal justice”. However, the country received a much lower ranking for “freedom of speech” and “freedom of assembly“. All public gatherings of five or more people require police permits, and protests may legally be held only at the Speakers’ Corner. Any who believe in the right of the people to demonstrate, march, protest and call out the government as happened during the last administration, would likely be perturbed by the restrictions Singapore places on freedom of speech, freedom of assembly and protest. In no respected gaming jurisdiction can the government remove a duly appointed member of a gaming commission without proof of wrongdoing. [I]f the government controls what the commission will or will not approve, this is the definition of corruption. A commission that is dependent upon the government for its jobs and funding will simply be a rubber stamp for any deal negotiated by the government along with any strings that are attached to such a deal. Perhaps some officials in Bermuda should contact the regulatory boards in New Jersey, Nevada, the United Kingdom or any reputable gaming jurisdiction. Find out what the procedure is in those regions to remove a sitting commissioner. It’s not easy. Mr. Simmon’s suggests he does have reasoning and decries Commission Chairman Alan Dunch as having been ineffective and having had an attitude towards the new government. So what are the regulations surrounding appointing and removing gaming commission members in New Jersey, Nevada and the United Kingdom? New Jersey has one of the strongest protections of independence with their commission having established fixed terms, bi partisan balance of appointments and removal only by cause. What of the UK? The law provides control to the Secretary of State (Minister) to appoint and remove commissioners as they see fit. 1 The Gambling Commission shall consist of a chairman and other commissioners appointed by the Secretary of State. (3)If the Secretary of State thinks that a commissioner is unable, unfit or unwilling to perform his functions, the Secretary of State may dismiss the commissioner. However, I was unable to find any examples where a commissioner was removed from the Commission by a Secretary of State. Nevada is less clear, there were no specific provisions that could be found in acts regarding the appointment and removal of regulators. The only references to the removal of a members was found was in a 2007 Reno based NewsReview.com article when the incoming governor made a stroke of midnight switch of appointees. The article goes on to note “Casino regulators serve fixed four-year terms to protect them from changes in administrations, governors have not always respected that process” and provides a couple examples. After the 1982 election, governor-elect Richard Bryan asked Richard Bunker to step down as Gaming Control Board chair, and Bunker complied. “I had indicated that I would like to appoint my own person, and he readily agreed to that,” Bryan said last week. After the 1966 election, governor-elect Paul Laxalt publicly requested Nevada Gaming Commission chair Milton Keefer and commission member James Hotchkiss to step down. They weren’t wild about the idea—Laxalt had attacked them both during the campaign—but within weeks they both resigned. The governor argued that he only wanted to replace the Chair and not the other members, noting a hands-off policy beyond the reappointment. In a more locally oriented comparison of independence, we could look at the Tourism Authority Act with regard to appointment of the Chairman and members. Certainly it should serve as an example of the opposition’s idea of independence given that it was set up to be independent of political interference. 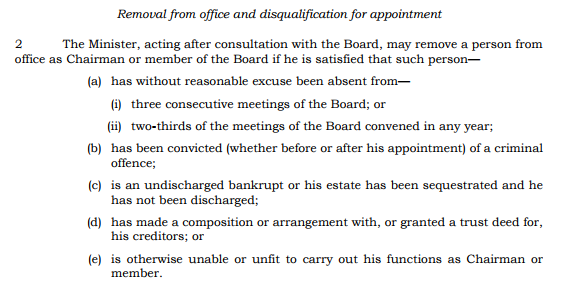 So in the case of the Bermuda Tourism Authority, the Chairman is appointed for a fixed term though can be removed with specific cause. What is perhaps the most interesting point to note is that among all of the jurisdictions mentioned, the only one which provided a provision for a Minister to “give directions to the Commission as to the policy” was Singapore. None of the other jurisdictions reviewed appeared to have any such provision to allow for a Minister to dictate policy itself. Overall, the consensus appears to be mixed with the strongest provisions for independence of commissions being New Jersey’s which allows for bi-partisan staggered appointments and removal only with specific cause. Singapore provides the most flexibility and provisions for Ministerial direction, though it lacks credibility towards independent governance which is accommodated by their low levels of historical corruption. This leads us to wonder, what are the best provisions for the future of our island to ensure the success and welfare of our fledgling gaming industry? If independence is a goal, why was the original act not modeled after New Jersey’s system to provide for bi-partisan balance of appointments, fixed terms and reasoned removal? If independence is not a goal, why have a commission at all? Are we satisfied enough with our track record on historical corruption on both sides of the isle that we can successfully emulate the Singapore model? Does the proposed amendment provide an environment where our industry will flourish? Does our existing law do so? Perhaps we should go back to the drawing board? A reader sent in a link to an interesting article of 2017 tech hub rankings. The ranking itself may largely be subjective, however it is interesting to note the criteria used to measure appeal as they are fairly indicative of what we need to be considering. It seems they’ve tried to balance appeal for both starting a business as well as attracting talent. The company behind the ranking provides a number of measures they use. In 2016 they used 8 categories. These kind of things are worth noting, especially those that are under Bermuda’s control such as the Startup Experience and the Time to Start a Business. Toronto and Montreal score high in the rankings because you can start a business in 2 days. How long does it take in Bermuda? The best way to kickstart a tech hub/scene in Bermuda is to have International Business and/or Government invite entrepreneurs to solve their business challenges. Stuart Lacey nails a key roadblock to building a tech hub in Bermuda. “What we need, and what Bermuda has in spades, is real businesses with real problems,” he said. This. So much this. The best way to kickstart a tech hub/scene in Bermuda is to have International Business and/or Government invite entrepreneurs to solve their business challenges. The best possible synergy can be found in identifying pain points within the industry that don’t represent the core value proposition of a business. Something that is a common problem across the industry that is not worth the investment to solve directly but would be welcomed as a third party solution. This is an essential component to kickstarting a tech hub/scene on island. The reason being is that the most challenging part of building a tech startup is finding product/market fit. Put in layman’s terms, startups have the most chance of success if their solution fits and solves a specific problem that people value enough to pay for. If, entrepreneurs can readily be paired with an industry (like our local insurance, legal and finance industries) to address their pressing non-core problems, we can plant seeds for Bermuda based startups. All of the other elements required to build and scale those startups are here, we just need to pull them all together. An absolute best first step would be for international business to openly invite and pitch to potential entrepreneurs challenges that they would readily like to see solved and would be willing to pay for. Building a global tech company is incredibly difficult. Many people think mega tech companies like Airbnb start just as an idea that raised millions of dollars. Seems easy. Few understand the real stories, like Airbnb having actually started as “Airbed and breakfast”, literally offering to rent out an airbed in a living room. That they struggled in their first year, amassing $40,000 in credit card debt and ended up raising money and marketing themselves via an election gimmick of selling re-branded cereal as “Obama O’s”. It wasn’t an instant jump to easy money, it was a long haul to build a tech business. Raising lots of money is only part of the process and its the part the average man on the street thinks tech companies are all about. Have some crazy idea, raise milllions, profit! It usually doesn’t work that way. The idea is only the beginning. You then have to prove your idea by self funding or raising money from friends and “angel” investors to try to take your idea to something tangible. You need to deliver something with promise before you can progress and this isn’t anywhere as easy as most people think it is. Just building a viable startup with a viable product is impossibly difficult. Then making it to the stage of scaling and possibly raising capital is on a whole other level. If Bermuda dreams to create a tech hub we need to truly understand what it takes to build great startups and how we can nurture them to success. We need to remember that every other country on the planet also has their eyes on attracting tech startups and talent. The process of building a successful global tech company is significantly more complicated that most people realize. 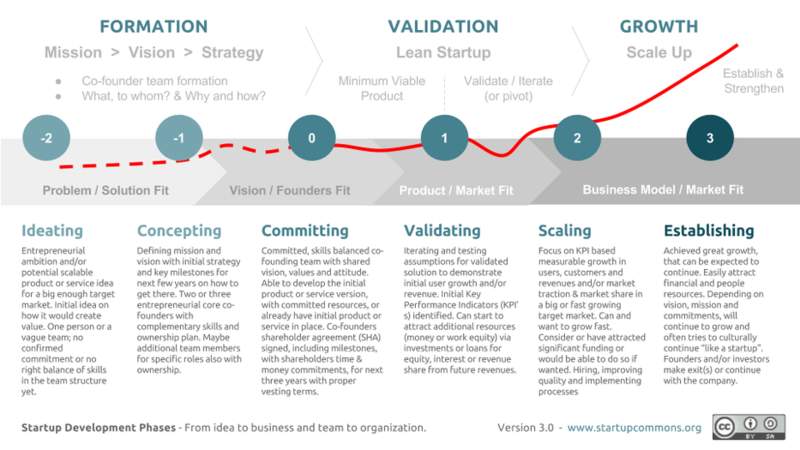 Here’s a great breakdown of the stages from startup commons. Building a team that can work together alongside a product that fits a market need is complex and expensive. During this period you likely have no profit or revenue and it may involve “pivoting” from one concept to another to achieve a viable product that fits a market need. Along the way you compete on a global scale facing well funded competitors, challenges and harrowing moments where you may go broke. Often times building a product requires a significant upfront investment before you can generate profits or revenue which can be different from other businesses. This makes the whole process different and quite a bit more challenging. The big challenge facing Bermuda is that the early stages are expensive and low taxes are not an advantage for companies with no profit. Low taxes are only advantageous for large established companies so we can’t think this will attract startups. Bermuda is one of the most expensive places to start a business, we don’t have an environment conducive to startups to offset the costs and the bureaucracy can be soul crushing. This needs to be changed and soon. While building my own tech company I traveled to places like Eastern Europe and South East Asia to keep costs low as a “Digital Nomad”. If I’d stayed on island paying rent I would have gone broke early on. You would be amazed at how nice of a hotel room you can get for $15 a night and the kind of meals you can find for 18000 dong (<$1) in places like Saigon. For years I had no income, was self funding or “bootstrapping” and was trying to stretch my savings to get my company off the ground. I settled permanently back on island largely because Bermuda is my home and I want to be here. It’s still a challenge because the less than average income I am able to pay myself would go a lot further anywhere else in the world than it does in Bermuda and I could probably reinvest more into my business instead. There are challenges for Bermuda if we don’t attract startups at the idea stage because if you build a team somewhere you’re unlikely to move it once you start scaling. It is hard to relocate a team once you’ve established a base somewhere, if you even do. In order to be competitive Bermuda needs to offer a great deal more than low taxes. Free office space in Southside with no support infrastructure, not even a restaurant, simply isn’t competitive when you compare what incubators and accelerators all over the world are offering. Almost every country on the planet wants to attract tech talent and startups and are incredibly welcoming for it. Bermuda, if it wants to build a tech hub, needs to provide a great deal more. Stuart Lacey, another Bermuda based tech entrepreneur who founded Trunomi, had some good comments in yesterday’s Royal Gazette covering it. Mr Lacey said a support system would need to be easily accessible to ensure the tech hub’s success. Mr Lacey said: “In order for any tech hub to be successful, it will require significant and specialised support infrastructure such as transport, accounting, banking, legal, catering, restaurants and hotels in the immediate vicinity. As Mr. Lacey notes, an RFI is a good start as it will give the government an idea of what the challenges are. A tech hub needs the right sort of environment to make it as friction-less as possible to start a company. It needs to be easy, quick and painless to start up in Bermuda. Registering your company, jumping through legislative hoops, setting up bank accounts, etc. Startups need opportunities to interact with local government and business to find opportunities where they can add value and build a viable business based upon industries we already have here. The list goes on. There is a great deal of support that needs to be provided to help founders turn an idea in to a business. If Bermuda wants to seriously compete in attracting startups and building a tech hub we need to take a long hard look at what is required and what we can do that no other destination can. We’re small, we have a wealth of local seed capital available, we have industries that could be leveraged for challenges to be solved and we could make doing business here easy, but the first step to disrupting industries likely needs to start with disrupting government. It needs to be easy, quick and painless to start up in Bermuda. Back in September, Jeremey Deacon put up a post speculating on the OBA’s future: Where does the OBA go from here? The first will be to elect a new Party leader which is, in itself, going to be interesting. They cannot elect someone with a UBP past, some of the OBA heavy hitters lost their seats at the last election, others have stepped down from the front bench or have left the Party altogether and they simply cannot consider turning the clock back, meaning there are meagre pickings. In my own opinion, the OBA is struggling for relevance at the moment and it doesn’t terribly matter who they elect. They fundamentally need to fix their very nature and it is far more of a task than simply picking a leader. I said as much in my 100 days commentary. “The OBA seem far too focused on what they think led to the PLP’s election win and not nearly focused enough on what led to their own loss. “The party they campaigned to be before the 2012 election and the party they became were incredibly different. “At their founding, they were to be a party of the people, collaborative and inclusive. Instead they became the opposite. One of the big differences with the founding of the OBA was that the people picked the leader, regardless of who it was. It was empowering for their supporters. After the JetGate scandal, the OBA simply held a meeting of party officials to pick the leader. I believe this was a mistake because the OBA took the power out of the hands of their supporters and held it themselves. The supporters had no say. The OBA is now returning to the membership to pick their leader as part of their constitution but the question arises of what does their membership look like? Do they have much of a following anymore? Will many people turn out? Is there any enthusiasm for the OBA at this point? Personally I suspect support and enthusiasm is rather low and they would struggle to attract supporters and candidates at the moment. I wrote some feedback in response to Mr. Deacon’s post on the link he shared on facebook at the time. The only way for the OBA to be viable is to wholly dedicate themselves to fulfilling the pledges of their 2012 platform to become a party of the people. Yes, that means putting the leadership contest out to whatever membership they have left and having the people choose, regardless of the outcome. The party itself needs to be directed and driven by the people, not by a small cadre of back room wheelers and dealers. However, I think the OBA has already tried this, failed and demonstrated that they can’t change. Few trust them to be different and as such they will struggle to attract any newcomers. The difference in the past for any attempts at a new party was that there was always a fear of splitting the vote that led to a bias to support the OBA. I think now people are convinced enough that the OBA would lose that many would shift to support a new party. If the OBA is going to regain any sort of relevance, it needs to put as much power in the hands of the people as possible. I had thought that they may have a leadership challenge open to any member however after clarification from the @1BdaAlliance twitter account, it turns out their constitution limits it to MPs. That unfortunate as it might have attracted some new faces or the possibility of a senator standing for leadership. Something different from the same faces that are tied to the UBP legacy and the OBA’s rough start. It looks unlikely with this requirement. Ultimately though, I don’t think it terribly matters so much who the leader is at this point. The entire party needs to be focused on a servant leadership approach that focuses on empowering the people rather than an ivory tower one. Unfortunately I really don’t see that as a realistic direction for the OBA because it just doesn’t seem to match their nature. I haven’t seen an indication from any of the OBA MPs that there is someone among them that can lead that sort of a change within the party. Perhaps they will prove me wrong and rejuvenate themselves. Time will tell. Why are there large gaps between Bermudian and non Bermudian occupational incomes? Here’s an interesting Sunday morning musing. I was taking a look through the 2017 Employment Brief and took a moment to look closer at the above tables on page 5. 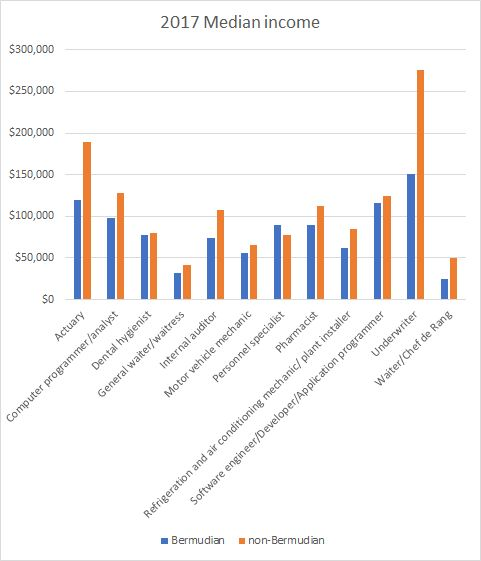 I noted that there are rather huge differences in income for various positions and I started wondering what explanation there might be. Before jumping to conclusions it is important to recognize that there could be a good story behind why these differences exist such as experience levels, differences in roles, education ,etc. With that said, I was rather surprised I hadn’t noticed it before, I suspect largely because the tables are sorted by total filled jobs which makes it harder to line up the occupational categories. This raises a whole wealth of questions about what story the underlying data tells. Do we have it annually? Can we track the progression of Bermudian incomes vs. non-Bermudian incomes for various roles? Can we get more granularity on details that give us a more complete picture like average ages, sub categories within roles, etc? There is alot of potential information here so I’ve written the stats department to ask where this information is sourced from as it isn’t available in the Employment Survey Tabulations I’ve been collecting over the years. To give you a better idea of what I’m seeing, here’s the table realigned alphabetically. Let’s remember, there could be many reasons for this so let’s not jump to conclusions, but it is definitely worth more explanation. I’ve added a column covering the difference in non-Bermudian vs. Bermudian as well. 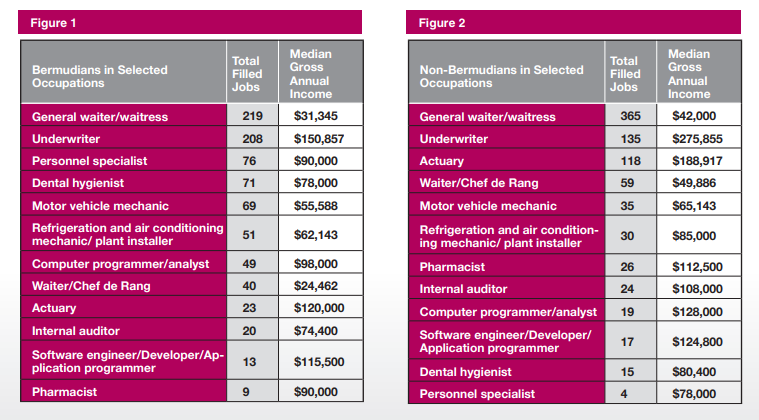 Only in the case of “Personnel specialists” do Bermudians make more on average. Here it is in chart form as well. Let’s hope the excellent and helpful staff of the Stats department (who in my opinion aren’t appreciated enough for the important role they do) can come back with some good information to dig into further. The following is commentary I provided to The Royal Gazette when asked about my thoughts on the PLP’s report of the first 100 days. Well, we’ve been presented with the PLP’s report on their first 100 days. I’m disappointed that not only were there fewer updates than I expected to see, but also that there was a considerable amount of spin. Premier Burt proclaimed “we have successfully completed or significantly advanced 21 of the 21”. When pressed in parliamentary questions of actual completed number he reduced this to 14. With such a massive majority and mandate, why is this sort of spin necessary? Why do we hold our politicians to such an unreasonable standard that they tell us only what we want to hear? Are we unable to handle the truth? When looking closely at the actual pledges, really only a handful have been fully completed by the 100 day mark. That shouldn’t discount that there indeed has been significant progress on a considerable number of them. Some, such as the MPs code of conduct, are justifiably delayed due to the process of passing bills through the senate. Others are held up for welcome consultation with stakeholders, which is to be applauded over rushing ahead. Then there are the ones that have surprisingly no progress. Wifi installation in schools is at the same state it was on September 8th. Communication with clubs regarding loan guarantees will commence shortly, when communication was already said to have begun on September 7th. Negotiations with public sectors unions were to be concluded and yet they are still negotiating with the only update having been that BIU President Furbert is “satisfied” with wage negotiations. Others still are “completed”, but remain little more than an idea with no real explanation of how they’ve been completed. With the PLP gaining the biggest majority and mandate in recent history, one has to wonder why it is necessary to spin the results rather than just tell us the truth. Only a fool expects our leaders to be perfect and deliver on every promise. It should, however, be reasonable to expect explanations for delays, course corrections and updated delivery dates. Lt/Col Burch’s statement in early October on the complications related to the relocation of the airport mail facility was a perfect example. He outlined issues encountered, their causes, options considered and the reasoning for an urgent choice of solution. Why isn’t that approach used across the board? Why is it only when the OBA is the cause of the delay that things can be fully explained? Why is it unreasonable to take an honest approach to pledges and say this is where we are, this is what happened, this is where we’ll be and this is our plan for how we’re going to get it done, even if delayed. Why do our politicians feel the need to spin things as if everything is perfect and going according to plan when they aren’t? Have we taken to upholding our politicians to impossible standards such that few can measure up? Is it of any surprise that few want to get involved? We pressure our leaders to create the perception that they are perfect when it’s impossible for anyone to be. We all make mistakes, no one is perfect and for the most part we’re all learning as we go. So, not all the pledges are completed, many have shown strong progress, some are in a holding pattern and a couple are still unknown. Hopefully regardless of the 100 day target, all will ultimately be competed and none will be conveniently forgotten. A real measure of progress and ongoing updates to ensure that happens would be welcome, but sadly, surprising to see. Doing so would require admitting that not all promises have been fully delivered and we expect our politicians to be perfect. It doesn’t say great things about our future if it is unacceptable that our leaders be less than perfect. It simply ensures that we won’t manage the future we desperately need. Our politicians need to be focused on delivering on their vision and working with the people, even if it takes longer than expected, rather than telling us only what we want to hear.